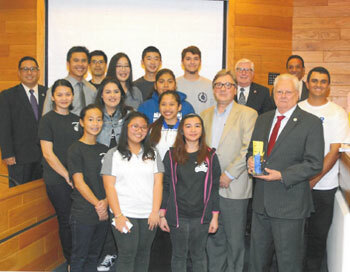 The Gahr High School Global Sustainability Project students presented their research findings on water quality and invasive species at the Don Knabe Community Regional Park and the Heritage Park to the Cerritos City Council and Mayor George Ray at a City Council meeting on February 9. In addition to the water quality study, students completed a public education program designed to inform visitors about how they can reduce invasive species at the lakes. The California Department of Fish and Wildlife and the City of Cerritos adopted the public education materials developed by the students. This water study and public education program, funded by the Picerne Family Foundation, were the first of their kind at the parks. Ten students who participated in this GSP local sustainability project will embark on a Foundation funded 12-day research expedition to South Africa this July. While there, they will assist Earthwatch scientists in fieldwork aimed at conserving endangered rhinos. Ms. Quyen Vu, A.P. Environmental Studies teacher, and Mr. Tam Lam, Biology AP teacher at Gahr High oversaw the students’ research. They will accompany the students on the South Africa expedition.